The South Alpine–Dinaridic realm was affected by igneous activity in the Middle Triassic; the marine carbonate platforms and the adjacent basins contain highly variable intrusive-volcanic assemblages. We studied the petrography and determined the zircon U–Pb ages of the Triassic volcanic products in the Transdanubian Range. The geochemical features and thus the geodynamic context of the magmatism are badly known, as the rocks experienced variable chemical alteration. The exact duration of the igneous activity is also poorly constrained, as the geochronological data of the former studies were obtained mostly by the weathering-sensitive K–Ar and Rb–Sr methods and thus some data even being younger than the age of the stratigraphic cover. The presence of andesite dikes and of pebbles and cobbles (< 20 cm) of basalt, andesite, rhyolite and of rhyolitic tuff in the Triassic carbonate platform deposits indicates that within the Transdanubian Range formed a volcanic complex in Triassic. The major mineralogical and geochemical features of the Transdanubian igneous suite are similar to the Triassic formations in the Southern Alps. However, dissimilar zircon composition excludes the immediate relationship of the zircon-bearing silicic formations in the two tectonic units. 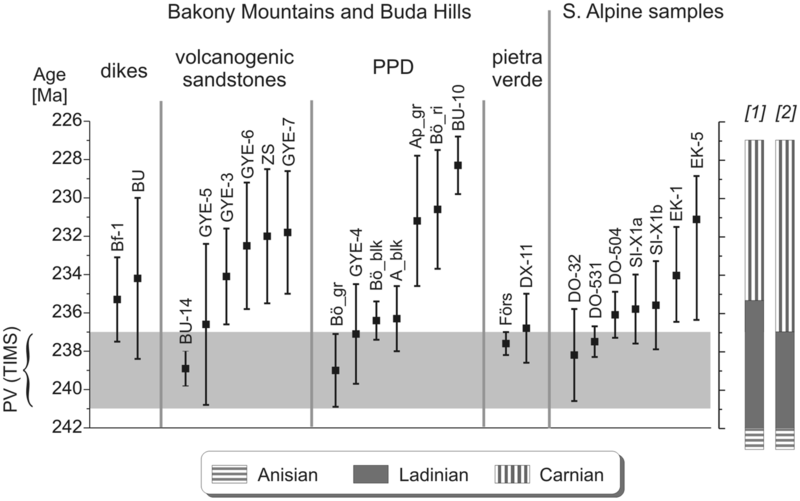 New U–Pb ages show that the beginning of the volcanic activity is probably coeval with the eruption of the widespread “pietra verde” trachytic tuffs in the Upper Anisian–Ladinian successions, but the majority of the ages are younger than those ash layers. The new age constraints give a bench-mark for the termination of the volcanic activity in Carnian time in the Transdanubian Range. The online version of this article ( https://doi.org/10.1007/s00531-019-01714-w) contains supplementary material, which is available to authorized users. The Transdanubian Range Unit is a part of the Alcapa Mega-unit (Haas 2013). This fault-bordered terrane—including the Bakony Mountains and Buda Hills—was located close to the Southern Alps at the northwesternmost edge of the opening Vardar ocean during the Middle–Late Triassic and it belonged to the wide carbonate shelf of the western Tethys (e.g. Kázmér and Kovács 1985; Haas et al. 1995; Vörös 2000). Presence of volcanic tuffs in the Triassic succession of the Transdanubian Range had been recognised already by Böckh (1873) in the Bakony Mountains (Fig. 1). According to Lóczy (1916), the Ladinian “Buchenstein beds” are made up of siliceous limestones, marls and “pietra verde” tuffs. These pyroclastic layers have trachytic composition and they consist of mainly sanidine, biotite, few quartz and secondary minerals (Szabó and Ravasz 1970; Ravasz 1973). Literature data and the present study provide evidence that, in addition to the late Anisian–Ladinian “pietra verde” pyroclastic fall deposits present in the Southern Alps and derived from an unknown remote volcanic centre, a Middle–Late Triassic volcanism also occurred within or close to the Transdanubian Range. This volcanic activity was documented by Raincsák (1980) and Budai et al. (2001) in the Middle Triassic succession of the Bakony Mountains. A comparison of the Middle Triassic volcanic successions of the Bakony Mountains, Bükk Mountains, Southern Alps and Northern Calcareous Alps was presented by Bechstädt and Mostler (1976), Cros and Szabó (1984), Szoldán (1990) and Harangi et al. (1996). They concluded that the Transdanubian Range may have been relatively close to the South Alpine volcanic centres, whereas the area of the Northern Calcareous Alps was located in a more distal position. This igneous activity—similarly to those of the Southern Alps—is slightly enigmatic, as it is localized in a passive margin setting during the development of carbonate platform successions. The geodynamic evaluations based on the geochemical character of the Southern Alpine and Dinaridic occurrences yielded ambiguous results, showing signs for both, continental rift and magmatic arc settings (e.g. Bébien et al. 1978; Beltrán-Triviño et al. 2016). Harangi et al. (1996) linked the Middle–Late Triassic volcanism to early extensional events that were followed by a more developed rifting phase in the Bükk Mountains, Bakony Mountains and Buda Hills. 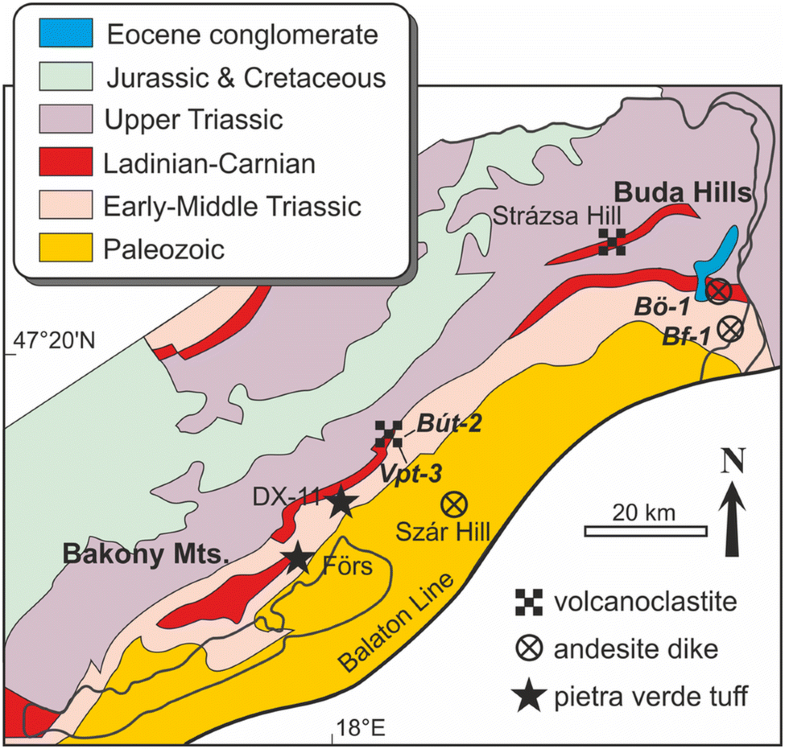 The aim of this paper is to complete the information about the puzzle of the dissected parts of the former carbonate platform by new petrographical and geochemical data from the Triassic volcanogenic formations of the Bakony Mountains and Buda Hills and to supply new time constraints by U–Pb ages for the duration of the volcanic activity. The Transdanubian Range is the uppermost unit of the Austroalpine Nappe System forming a syncline structure (e.g. Tari et al. 1992). The development of its Upper Permian–Lower Cretaceous formations shows close affinity with that of the Southern Alps (Lóczy 1916; Haas and Budai 1995). The thickest part of the sequence is made up of Triassic shallow marine carbonates (Haas 2013). The Triassic magmatic dikes, volcanic pebbles and cobbles occur in three formations in the Bakony Mountains and in the vicinity of the Buda Hills (Fig. 2). The Upper Anisian Vászoly Formation contains distal, several cm-to-max 2 dm-thick, bentonitised trachytic, sometimes graded, primary fallout tuff layers (Budai et al. 1999, 2001, 2015). These strata are equivalent to the slightly thicker “pietra verde” layers in the Dolomites (Mojsisovics 1879), and they are widespread in the entire Southern Alpine–Dinaridic realm (e.g. Obenholzner 1991; Jelaska et al. 2003). The biostratigraphic assignment of these ash layers is well constrained by ammonoid, conodont and radiolarian data to be in the Reitzi Zone (Vörös 1993; Dosztály 1993; Kovács 1994; Pálfy et al. 2003). The zircon content of the ash and bentonite layers of mostly trachytic chemical character allowed highly precise U–Pb geochronology (see details below). According to the accurate biostratigraphic, isotope geochronologic and paleomagnetic constraints (Márton et al. 1997) the Felsőörs section was even proposed as a candidate for a Global Stratotype Section and Point for the base of the Ladinian stage (Vörös et al. 1996, 2003). Andesite dikes are known in the quarry of Szár Hill at Polgárdi and they have been detected by the Budaörs-1 and Budafok-1 cored deep drillings of the Buda Hills (Kubovics 1985; Dunkl et al. 2003; Haas et al. 2017). The well exposed, gray porphyritic dikes in the Szár Hill quarry, are 5–10 m thick, while the apparent thicknesses of the partly fault-bounded dikes in the boreholes are between 60 and 186 m (Budaörs-1 and Budafok-1, respectively). Pebbles of volcanic rocks were recognized in the Middle Triassic sequence of the Bakony Mountains (Raincsák 1980). This volcanoclastic sandstone (Inota Fm.) was correlated with the Wengen Group of the Southern Alps (Mojsisovics 1879; Budai and Vörös 1993; Budai et al. 2001). Clasts of volcanic rocks were also found at the base of the Upper Eocene transgressive sequences of the Buda Hills (Wein 1977; Horváth and Tari 1987; Farics et al. 2015). As will be discussed below, the “pietra verde” tuff originated from remote sources, while the (2) and (3) type formations are local volcanic products within the Transdanubian Range (Budai et al. 2001). With the exception of a single U–Pb age (Haas et al. 2017), only whole-rock, biotite and hornblende K–Ar data are available from the dikes and pebbles (Balogh et al. 1983; Horváth and Tari 1987). The dated aliquots contain highly variable amounts of potassium and radiogenic argon, and they yielded a wide age range from 240 to 25 Ma. The isotopic systems have been strongly influenced either by the interaction of the dikes with the carbonate host rocks or by the weathering of the pebbles. Thus, their significance for the timing of eruptions and on the duration of the volcanic activity is weak. According to the palaeogeographic reconstructions, the Transdanubian Range was located in the neighbourhood of the Southern Alps before the Alpine orogeny (Kázmér and Kovács 1985; Haas et al. 1995; Schmid et al. 2008). Thus, it is necessary to insert a short review of the well exposed and studied Triassic igneous formations of the Southern Alps before the evaluation of our new results from the Transdanubian Range. The “pietra verde” tuff layers (e.g. Obenholzner 1991) were dated both in the Alps and in the Bakony Mountains by high precision and accuracy and those data were contributed even to the global calibration of the Triassic chronostratigraphic scale (Mundil et al. 1996, 2010; Pálfy et al. 2003; Brack et al. 2005; Furrer et al. 2008; Stockar et al. 2012; Wotzlaw et al. 2018). The ID-TIMS data reveal that these trachytic eruptions took place between 242 and 237 Ma. The Predazzo Complex is the largest of the Triassic intrusive igneous bodies of the Eastern Southern Alps. The intrusive rocks show wide variation in composition: monzonite is the dominant rock type, but monzodiorite, monzogabbro, gabbro with pyroxenite, granite, quartz-syenite and syenite, also occur (Lucchini et al. 1982; Menegazzo Vitturi et al. 1995; Visonà 1997; Carraro and Visonà 2003; Casetta et al. 2018). The dike rocks are also highly diverse: latibasalt, latiandesite, K-basanite, monzosyenite, aplite and lamprophyre were reported by Gallitelli and Simboli (1971). Some of the carbonate platforms of the Dolomites are covered by subaerial basaltic flows (e.g. Monte Agnello), but submarine formations like pillow lavas and hyaloclastite-rich volcano-sedimentary formations are more common in the intra-platform basin fill (Gaetani et al. 1981; Preto et al. 2001; Bosellini et al. 2003; Budai et al. 2005; Németh and Budai 2009). In the western Southern Alps the Montecampione subvolcanic complex shows slightly more alkaline character, but the sodium, potassium and trace element contents were probably influenced by intense fluid circulation (Armienti et al. 2003). The geodynamic interpretation of this magmatism is debated because beyond the obvious traces of Triassic syn-sedimentary extensional tectonics manifested, e.g. by half-grabens (Bertotti et al. 1993; Budai and Vörös 1993, 2006; Velledits 2006), strike-slip and compressional tectonics make the image more complex (Castellarin and Rossi 1981; Blendinger 1984; Castellarin et al. 1988). However, the wide spectrum of rock types and their trace elements and Hf-isotope systematics would fit to an extensional regime. Beltrán-Triviño et al. 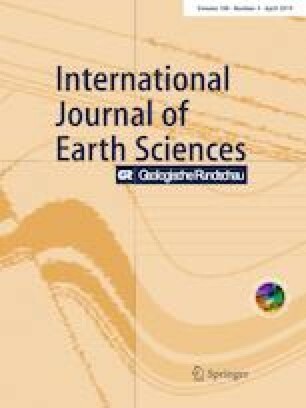 (2016) related the Triassic magmatism to an asymmetrical continental rifting process that affected the entire Southern Alps and the adjacent areas. The geodynamic evaluation of the Triassic volcanism in the Dinarides resulted in similar dilemma; the compositional spectrum of the lithologies (from basalt to rhyolite) and their geochemical features match neither to the rifting nor to the arc settings (Bébien et al. 1978). Evaluating the age constraints from the Predazzo Complex and from other Triassic volcanic formations, we should distinguish between weathering/alteration-sensitive and more robust geochronometers. 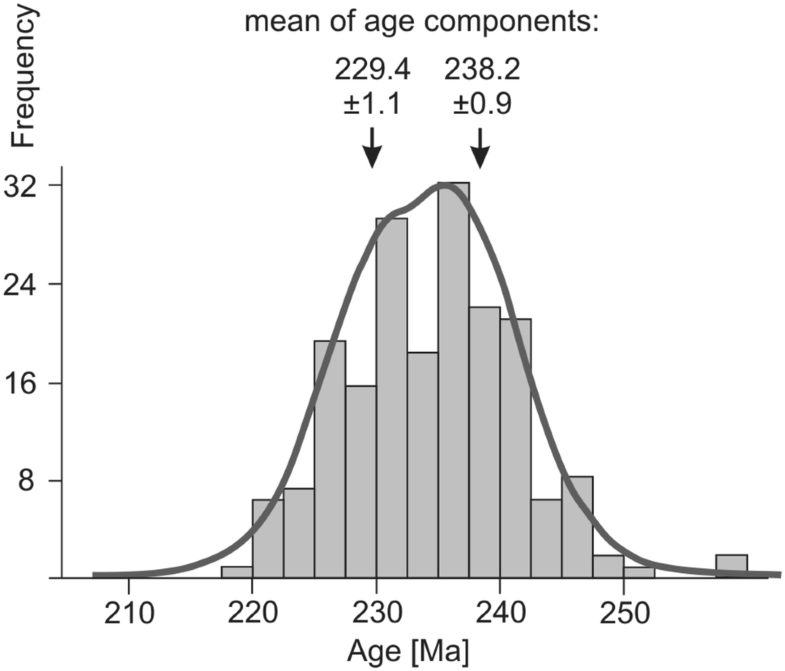 The Rb–Sr and K–Ar ages scatter between 230 and 204 Ma (Borsi and Ferrara 1967; Borsi et al. 1968; Ferrara and Innocenti 1974; Webb 1982; Crisci et al. 1984; Laurenzi 1994; Visonà 1997; Balogh and Németh 2005). Similar to the Bakony Mountains, some of these ages clearly post-date the stratigraphically proven age range of the volcanic activity. U–Pb and Sm–Nd ages (246–224 Ma) are available only from a few igneous bodies of the Southern Alps (Zanetti et al. 2013; Storck et al. 2018), Eisenkappel pluton (Lippolt and Pidgeon 1974; Miller et al. 2011), Western Carpathians (Putiš et al. 2000), Bükk Mountains (Haas et al. 2011; Kövér et al. 2018), Eastern Alps, and northwestern Dinarides (Neubauer et al. 2014). We collected “pietra verde” tuff, volcanogenic sandstone and conglomerate drilling core and outcrop samples from Triassic strata and from the base of the Eocene transgressive sequence that unconformly covers the partly eroded Triassic successions. Actually, all known and accessible volcanic formations (Vászoly Fm., Inota Fm.) were sampled in the Bakony Mountains and Buda Hills. Additionally, we have taken seven pilot samples for geochronology and zircon geochemistry from the Triassic igneous formations of the eastern Southern Alps. The localities of the dated samples are listed in Table 1, and a list of petrographically analysed samples is given in the Electronic Supplementary Material (ESM_1.xls). To represent properly the sources of the coarse volcanic fragments, we performed pebble-population dating (PPD-method; Dunkl et al. 2009) on selected and amalgamated andesite, and acid volcanite + ignimbrite pebbles. These “PPD” samples were composed of a representative selection of 16–54 equal-sized volcanic rock pebbles or pebble fragments. For the petrographic investigation of the volcanic rocks Olympus BH2 polarization microscope was used. The composition of feldspar, pyroxene, and amphibole was determined with AMRAY 1830 scanning electron microscope with EDAX PV 9800 ED spectrometer at the Eötvös University, Budapest. Major, trace and rare earth elements of the whole-rock samples were measured at the University of Göttingen by X-ray fluorescence analysis, and by ICP–AES and ICP–MS techniques in ACME Labs (Vancouver). Zircon crystals were fixed on a double-side adhesive tape stuck on a thick glass plate and embedded in a 25 mm diameter epoxy mount. The crystal mounts were lapped by 2500 mesh SiC paper and polished by 9-, 3-, and 1-micron diamond suspensions. Cathodoluminescence images were obtained using a JEOL JXA 8900 electron microprobe at the University of Göttingen to study the internal structure of the zircon crystals and to select homogeneous parts for in situ age determination. The U–Pb dating was performed by laser-ablation single-collector sector-field inductively coupled plasma mass spectrometry (LA–SF–ICP–MS). The method employed for our analyses has been described in detail by Frei and Gerdes (2009). We used a Thermo Element 2 mass spectrometer coupled to a Resonetics excimer laser with Laurin Technic 155 constant geometry ablation cell. All age data presented here were obtained by single-spot analyses with a laser beam diameter of 33 µm and a crater depth of approximately 10 µm. The laser was fired at a repetition rate of 5 Hz and at nominal laser energy output of 25%. The data reduction is based on the processing of ca. 50 selected time slices (corresponding ca. 14 s) starting ca. 3 s. after the beginning of the signal. If the ablation hit zones or inclusions with highly variable actinide concentrations or isotope ratios, then the integration interval was slightly resized or the analysis was discarded (~ 1% of the spots). The individual time slices were tested for possible outliers by an iterative Grubbs test (applied at P = 5% level). The age calculation and quality control are based on standard-sample bracketing using GJ-1 zircon reference material (Jackson et al. 2004). For further control the Plešovice zircon (Sláma et al. 2008), the 91,500 zircon (Wiedenbeck et al. 1995) and the FC-1 zircon (Paces and Miller 1993) were analysed as “secondary standards”. The results obtained on the zircon reference materials express the precision and the accuracy of the dating method applied (see details in Electronic Supplementary Material ESM_2.pdf). Drift- and fractionation-corrections and data reductions were performed by our in-house software (UranOS; Dunkl et al. 2008). The concordia plots were constructed by the help of Isoplot/Ex 3.0 (Ludwig 2012). The Triassic volcanic formations are often altered, most of the phenocrysts are replaced by secondary minerals and we can observe only pseudomorphs after them. Due to strong alteration, it is often not possible to achieve a reliable geochemical classification. In these cases, we characterized the samples according to their petrographic features. The lava and dike rocks are mostly comprised of andesite. The unaltered porphyritic andesite contains large-zoned labradorite-andesine and small andesine-basic oligoclase crystals, hypersthenic orthopyroxene, and subordinately augitic clinopyroxene and biotite. The amphibole is hornblende in composition and it was found only in the andesite dikes of the Szár Hill (Fig. 3a). Ilmenite, apatite, garnet, magnetite, zircon and monazite are the accessory minerals. The phenocrysts are often replaced by clay and opaque minerals, chlorite, chalcedony, carbonate, and sericite (Fig. 3b, c). In the fine-grained groundmass thin laths of plagioclase, and variable amounts of partly altered (chloritized) glass are present. In the samples from the lower part of the dike in Budaörs-1 well-intense K-metasomatism was detected, the plagioclase altered to K-feldspar (Fig. 3d). Complete alteration of the groundmass to secondary silica is observed, especially in the volcanic clasts of the Eocene conglomerates. The vesicles are filled mostly by chalcedony and glauconite. The andesite often contains microdiorite inclusions. In the Bakony Mountains and in the Strázsa Hill quarry (Zsámbék), the volcanogenic sandstones and conglomerates form clast-supported, polymict deposits. Subangular-to-subrounded mafic–intermediate volcanic clasts are usually much larger (up to 20 cm) and more common than the subrounded acidic volcanic clasts (≤ 3 cm). The phenocrysts are completely altered to secondary minerals, but three types of mafic lithologies can be distinguished. One type contains abundant vesicles and a few pseudomorphs after plagioclase, pyroxene and olivine phenocrysts (Fig. 3e). The other type has an intersertal texture with plagioclase microliths in the groundmass and few pseudomorphs after plagioclase and mafic phenocrysts. The third type is microgabbro with intergranular texture; the xenomorphic mafic minerals occur in the spaces among the plagioclase laths. Some of the andesites are characterized by the presence of porphyric labradorite–andesine plagioclase, hypersthenic orthopyroxene and few biotite as well as laths of andesine-basic oligoclase plagioclase in the groundmass (Fig. 3f, g). In several pebbles the plagioclase has been replaced by K-feldspar due to intense K-metasomatism. The latite–trachyte pebbles are characteristically different from the andesite, they contain primary alkali feldspar (K-feldspar) and less plagioclase. Another type of basaltic/andesitic clasts is vesicle-rich and contains only plagioclase phenocrysts (Fig. 3g). The acidic volcanic pebbles consist of quartz, K-feldspar and biotite. Rhyolite contains dark and light flow banding and has poorly developed micropoikilitic texture (Fig. 3h). Three types of devitrificated rhyolite lava and rhyolite tuff can be found. The first one consists of mostly pumice and few glass shards with very few labradorite phenocrysts and more acidic plagioclase microliths. The second one has perlitic texture, and the third one has spherulitic texture. Acidic tuff clasts (only in the Strázsa Hill quarry) contain pumice and Y-shaped glass shards, pseudomorphs after K-feldspar and biotite flakes, as well as lithic fragments (Fig. 3i). Beside the lithoclasts, the labradorite-basic oligoclase, hypersthenic orthopyroxene, hornblende amphibole, biotite, augitic clinopyroxene and altered olivine crystal fragments are in the volcanogenic sandstone layers of the Bakony Mountains, as well as strongly altered plagioclase (mostly altered to K-feldspar), biotite, pyroxene, quartz in the volcanogenic sandstones of the Strázsa Hill quarry. In the basal layers of the Eocene conglomerate of the Buda Hills we found mostly andesite and acidic lava and tuff pebbles (Fig. 3j). 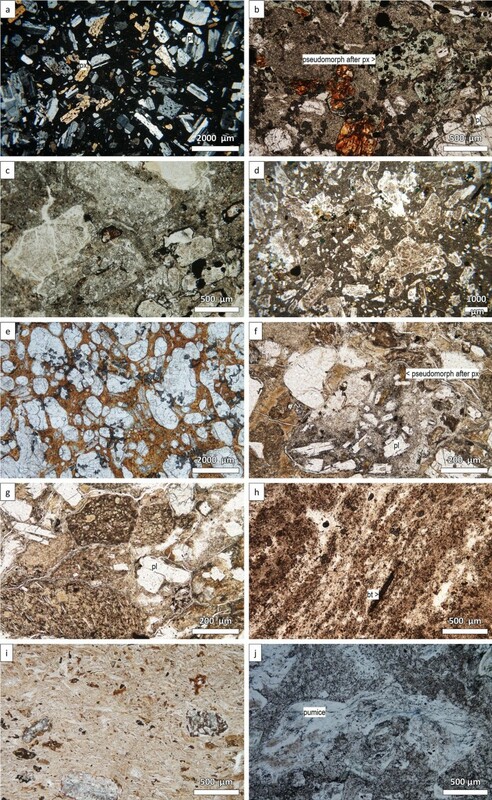 The volcanic rocks showing mafic petrographical characters are strongly altered and are not suitable for geochemical analysis (LOI up to 20%; Electronic Supplementary Material ESM_3.xls). However, there are some less altered intermediate and felsic volcanic samples from Buda Hills, Strázsa Hill quarry and Bakony Mountains that yielded useful major and trace element data. Nevertheless, these rocks still have some significant LOI content, therefore their compositions should be evaluated with caution. All samples are plotted on the total alkali versus silica (TAS) diagram after recalculation to anhydrous basis (Fig. 4). They fall mostly into the andesite field, whereas a few samples are rhyolite. The samples showing trachyandesite–trachyte compositions could have experienced some alkali enrichment during alteration, whereas alkali leaching can not be excluded in case of a few samples. Immobile trace elements can be effectively used as indicators for rock types (Pearce 1996) even for altered and slightly metamorphosed rocks. Based on the Nb/Y vs. Zr/TiO2 diagram the analysed rocks are mainly andesite in spite of their TAS classification. The immobile trace elements suggest subalkaline affinity (Fig. 4), and they plot in the active continental margins field in the tectonomagmatic setting discrimination diagram of Gorton and Schandl (2000) for felsic and intermediate rocks (Fig. 5). 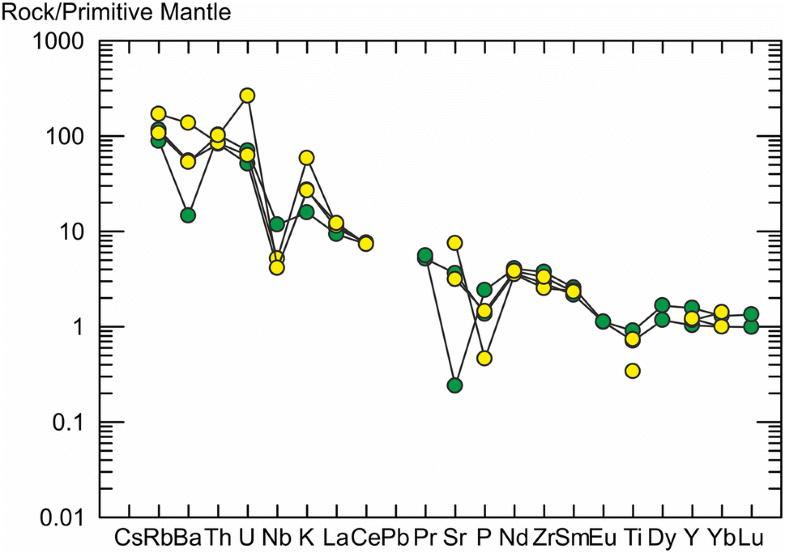 The samples having andesitic petrographical character usually show enrichment in LIL elements (Ba, Rb, Th, U) and negative anomalies for certain HFS elements (Nb, P, Ti), although the latter ones are not always pronounced (Fig. 6). The REE patterns of most andesite samples are similar with negative Eu anomaly, suggesting plagioclase fractionation. Notably the samples classified as rhyolite and trachyte based on their petrographic character show much larger compositional distribution, having lower and higher values for LREE. This compositional variation can be traced also on the multivariate trace element diagrams (Fig. 6). The strongly altered character of the studied volcanic rocks is reflected in their mineral assemblage, since only a few samples contain detectable mafic minerals, such as pyroxene and amphibole. Pyroxene is present only in a few mafic and intermediate volcanic samples of the Transdanubian Range. The orthopyroxene has a composition from En57 to 53 mol %, while clinopyroxene is of augitic composition. Amphibole can be found only in the samples from Szár Hill quarry and wells of Bakony Mountains, they are Mg-hornblende and tschermakite. Plagioclase shows a wide compositional range with An content ranging from 10 to 70 mol % (ESM_4.xls and ESM_5.pdf). Laser-ablation ICPMS U–Pb geochronology was performed on 485 separated, CL-mapped, zircon crystals in the GÖochron Laboratories of the University of Göttingen. Some samples have poor zircon yield, due to either their mafic character, or due to the small amount of the available drilling cores. Ca. 20% of the obtained ages were much older or younger than Triassic; these spots were measured probably on xenocrystals of the Triassic magmatites or on Cenozoic igneous pebbles that were mixed into the PPD samples pooled from the Eocene strata. A synopsis of the results is listed in Table 2, the detailed analytical data are given in the Electronic Supplementary Material (ESM_6.xls and ESM_7.pdf). Where possible, the ages were calculated as concordia age, otherwise we considered only those analyses that are 100 ± 10% concordant and applied the Isoplot “ZircAge” algorithm to express a mean age for the crystallization of the most reliable zircon population according to Ludwig (2012). The age data are grouped according to major types of the samples and the mean values with the uncertainty intervals are plotted in Fig. 7. Before the presentation of the results from Transdanubian Range we should consider the U–Pb data obtained on the Eisenkappel intrusion. This narrow granitoid body is situated along the Periadriatic Line and was dated already by several methods and yielded 227 ± 7 Ma biotite and 244 ± 8 Ma hornblende K–Ar ages, 230 ± 5 Ma titanite U–Pb age and 238.4 ± 1.9 Ma and 242.1 ± 2.1 Ma garnet-whole rock Sm–Nd ages (Lippolt and Pidgeon 1974; Miller et al. 2011). Our new laser-ablation zircon U–Pb ages (234.1 ± 2.5 and 231.2 + 5.8 − 2.2 Ma) are close to the formerly measured titanite U–Pb ages and obviously younger than the Sm–Nd data. Component analysis was performed on the ± 10% concordant single-crystal 206Pb/238U ages determined in the volcanoclastic formations. 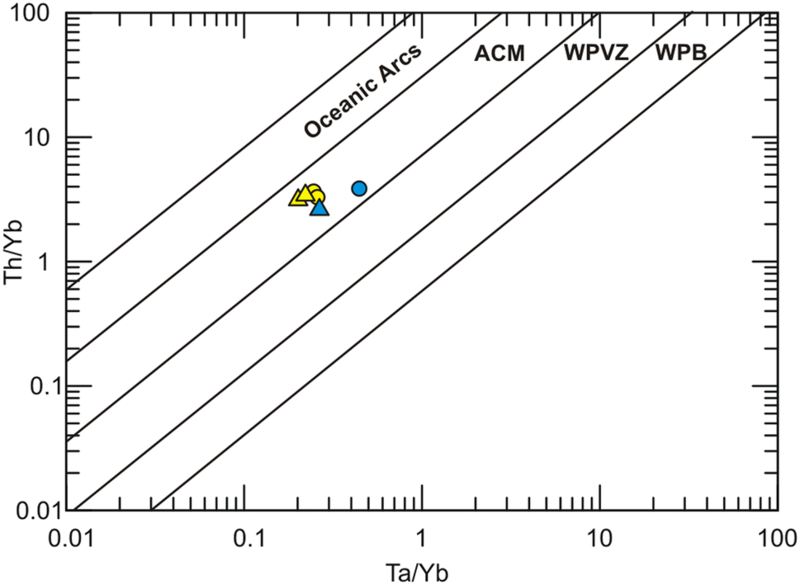 The individual samples contain relatively low number of single-crystal ages, thus their component analyses do not result in a reliable image on the substantive age components of the entire volcanic activity. That is why we evaluated the pooled data composed from the single-crystal ages of all samples from the Transdanubian Range by the component analysis methods. This pooled data set does not contain the ages obtained on the distal “pietra verde” ash layers, as the aim of the dating and component analysis were to characterize the local volcanic sources. Two different algorithms were used to identify the age components: “PopShare” (Dunkl and Székely 2002) and “DensityPlotter” (Vermeesch 2012). The former procedure assumes Gaussian distribution of the age components and uses the simplex algorithm (Cserepes 1989), while the “Density Plotter” uses the normal mixture modelling algorithm of Galbraith (2005). Beyond the Triassic age components Paleogene and Permian age components were also isolated from the Eocene conglomerates, but these are not in the scope of the current study. The Triassic age spectra could be decomposed to two major age components (Fig. 8). The two procedures resulted in identical mean values: 238.1 ± 4.0 (s.d.) and 238.2 ± 0.9 (s.e.) for the older, and 228.1 ± 3.4 (s.d.) and 229.4 ± 1.1 (s.e.) for the younger age component (“PopShare” and “DensityPlotter”, respectively). The isolated older age component corresponds to the younger TIMS ages of the “pietra verde” ash layers (e.g. Pálfy et al. 2003; Mundil et al. 2010; Wotzlaw et al. 2018) and indicates that coarse-grained younger volcaniclastic sediments contain reworked fragments also from this slightly older volcanic event. The younger age component is an obvious proof on a distinct period of volcanic activity in Carnian time. The dikes and pebbles are mineralogically and chemically strongly transformed, thus the petrographical character of the volcanic rocks should be deduced mostly from the preserved mineral assemblages. The spectrum is wide, beyond quartz and K-feldspar both calcic and sodic plagioclase occur, and the mafic minerals also reflect the highly variable composition: olivine, pyroxene, amphibole and biotite were recognised. Only andesite dikes were hit by the deep drillings and exposed in the quarries, and in the pebbles and cobbles the most dominant lithologies are andesite, basaltic andesite, latite-trachyte, rhyolite and rhyolite tuff. One should consider the selective decomposition; the preserved pebble spectra are biased by the loss of mechanically and chemically more sensitive lithologies like weakly welded tuffs and foid-bearing rocks. A part of the volcanic rocks has altered chemical composition, as shown by the elevated LOI and the large variation in alkaline contents. In addition, even the relatively immobile HFS trace elements appear to show some secondary modification which makes the rock classification difficult. Nevertheless, most of the analysed samples can be classified as andesites based on fluid-immobile incompatible trace element ratios. 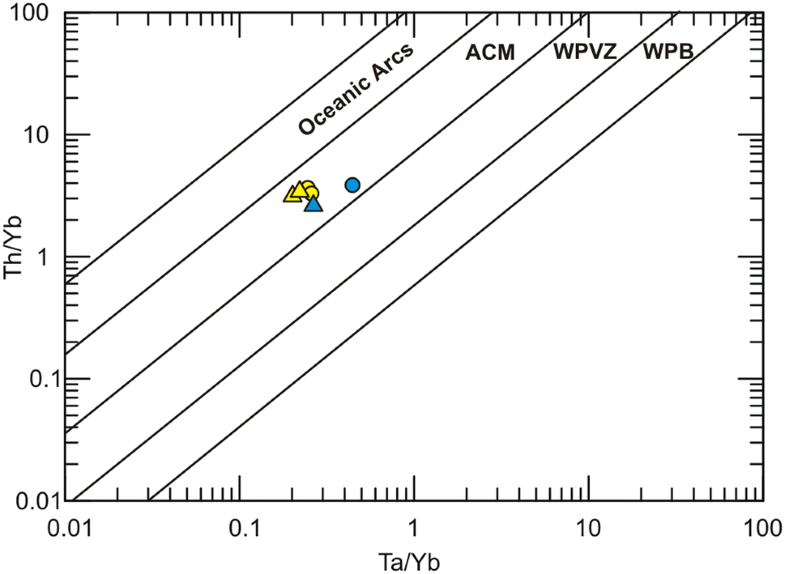 The classification of the silicic volcanic rocks is more problematic, since fractionation of accessory minerals strongly affects these element ratios. The revised Th/Yb–Ta/Yb diagram (Gorton and Schandl 2000 after Pearce 1982, 1983) is used to infer the tectonic affinity of the volcanic rocks. All of them fall into the active continental margin field based on the relatively low Ta/Yb ratios. This geochemical character is similar to the rocks from the Dolomites (Castellarin et al. 1988) and confirm their common petrogenesis. According to our point of view the negative Nb–Ta anomaly in the trace element pattern and thus a lower Ta/Yb ratio could also originate from lithospheric mantle metasomatized by subduction-related fluids in the past and remobilization during a lithospheric extension event (Sloman 1989 and Bonadiman et al. 1994). Together with the presence of the dikes-penetrating platform carbonate and basinal carbonate successions, the abundance and large size of the Triassic volcanic pebbles and cobbles indicate that their source was within the Transdanubian Range. Long transport distance is not a plausible scenario for the provenance of the pebbles. A longer river could not develop on the passive margin that was dominated by the patchy arrangement of carbonate reefs and basins. Longer, wave-driven sediment transport alongshore or between the reef bodies is also not a feasible scenario due to the coarse size and partly angular shape of the detritus and the sensitivity of the volcanic lithologies to weathering. Pebbles of intrusive rocks are present only in minor amount in the Triassic and in the Eocene conglomerates, thus we assume a volcanic centre, but the intrusive-subvolcanic root is less developed than in the case of the Predazzo Complex, or the erosion has not exhumed the subvolcanic level yet. The new U–Pb ages indicate that in the Transdanubian Range the deposition of the Anisian–Ladinian “pietra verde” tuff was followed by Carnian volcanism with variable, mafic to acid character. Remarkable, that the Triassic volcaniclastic successions in the central and eastern Southern Alps (Garzanti 1985) do not contain a distinct Carnian age group. The youngest U–Pb data of Beltrán-Triviño et al. (2013) form just a diffuse tail of “pietra verde” age components. Our U–Pb ages from the Eisenkappel granite confirm its Carnian emplacement age. 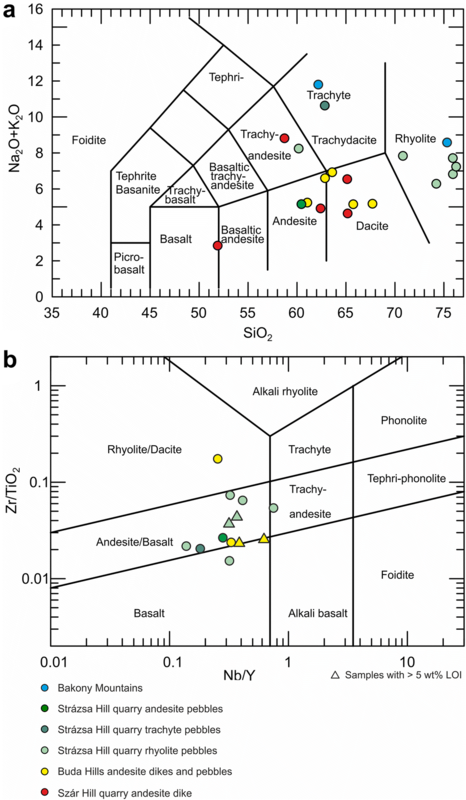 As these ages are missing from the siliciclastic formations studied by Beltrán-Triviño et al. (2013) we can assume that this pluton was not yet exhumed to the surface and eroded in the Triassic or its contribution in the sediment was strongly diluted due to its minor size. Outside of eastern Southern Alps Carnian U–Pb ages or age components around 235–220 Ma were reported in the western Southern Alps (Crisci et al. 1984; Cassinis et al. 2008; Zanetti et al. 2013), in the Dinarides (Neubauer et al. 2014), in the Bükk Mountains (Haas et al. 2011; Kövér et al. 2018) and in Asia Minor in clastic sediments and also in a rhyolitic–andesitic volcanic succession (e.g. Ustaömer et al. 2016; Özdamar et al. 2013). It is useful to consider the actinide content of the dated zircons as a kind of diagnostic “proxy” for provenance purposes. 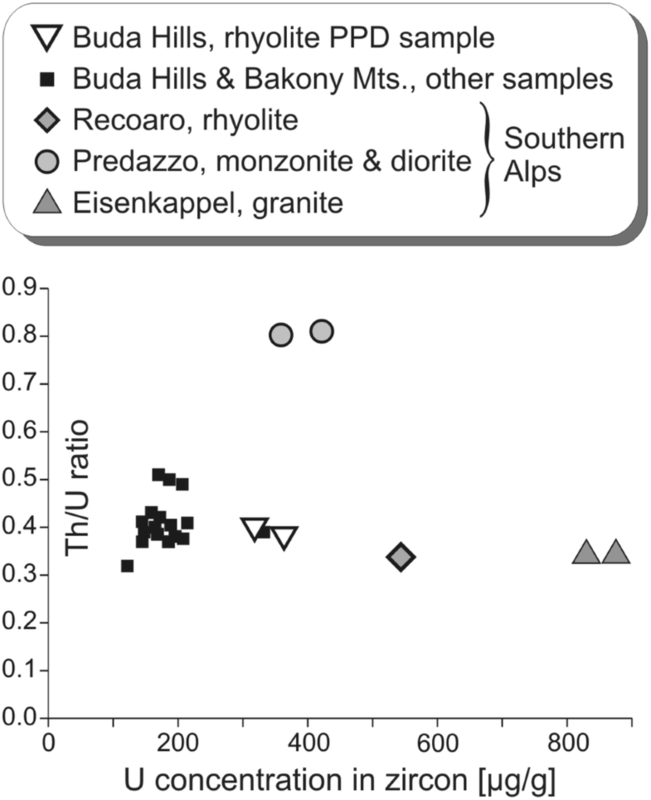 The U content and the Th/U ratio of the dated zircon crystals indicate an obvious difference between the Triassic volcanic rocks of the Transdanubian Range and the pilot samples from the Southern Alps (Fig. 9). Thus, the immediate derivation of the volcanic pebbles found in the Transdanubian Range the silicic formations of Predazzo and Eisenkappel is rather unlikely. The presence of dikes and the proximal volcaniclastic material indicates volcanic eruptions in the Transdanubian Range in the Middle–Late Triassic. The composition of volcanic products covers a wide range from basalt to rhyolite. Although andesites are common, it is possible that the character of volcanism is bimodal, but the selective weathering/alteration biases the initial lithological variation. Volcanic textures are dominating, the intrusive and subvolcanic lithologies are scarce among the pebbles. 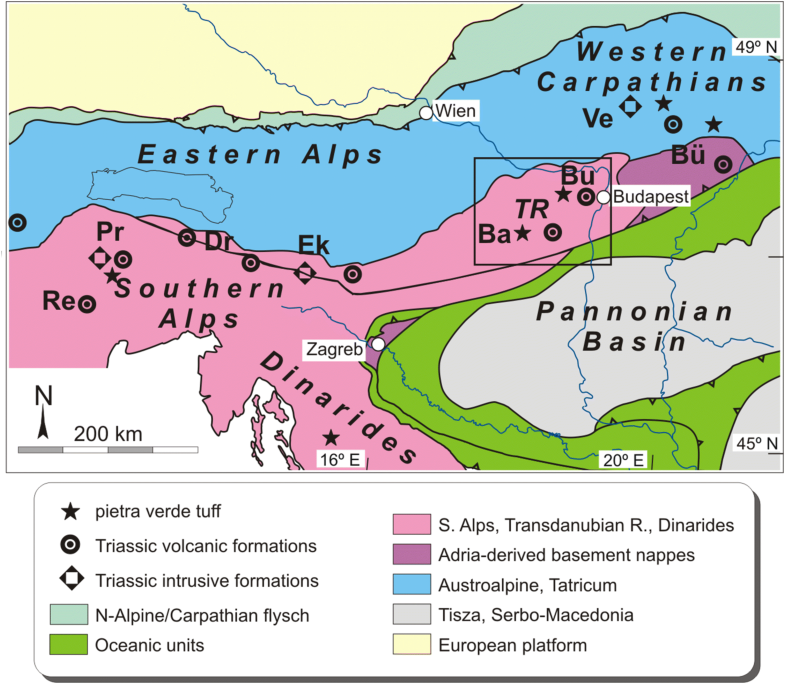 The character of the igneous activity in the Transdanubian Range is similar to the South Alpine one. The local half-graben basins developed coevally with the volcanism indicating that the trigger of the magmatism was the extensional tectonics affecting the passive margin of the Adria plate; however, their geochemistry also shows active margin character. Zircon U–Pb ages were determined on andesite dikes, tuff layers and on variable volcanic fragments from different clastic sediments. The sample-mean ages are between 239 and 228 Ma. We could identify two age components by the evaluation of the pooled single-grain ages determined on detrital zircons and on pebble-population samples. Thus the volcaniclastic formations record two major periods of activity of zircon-bearing volcanism at 238 Ma and around 229–228 Ma, indicating well the presence Carnian magmatic activity within the Transdanubian Range. The geochemical character of the dated zircons differs from the composition of the zircon pilot samples from the Dolomites and Carnic Alps, and that rules out the origin of the pebbles and cobbles from the sensu stricto South Alpine igneous formations. The new zircon U–Pb age of the Eisenkappel granite approves the formerly published titanite U–Pb age and thus the emplacement age can be considered also as Carnian. The CL images of the dated zircons were prepared by the kind help of Andreas Kronz (Göttingen). Guido Meinhold (Keele University) sharpened the English text of the manuscript. Discussions with Franz Neubauer (Salzburg), the suggestions of Vincenzo Picotti, Christoph Breitkreuz, an unknown reviewer and the editorial handling of Wolf-Christian Dullo significantly improved the quality of the manuscript. Many thanks for their kind help. The project has been supported by the European Union, co-financed by the European Social Fund (EFOP-3.6.1.-16-2016-00004) entitled by Comprehensive Development for Implementing Smart Specialization Strategies at the University of Pécs.